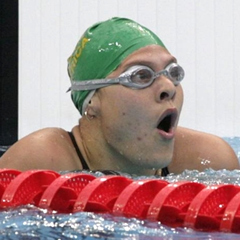 Johannesburg - Paralympic Games triple gold medallists Natalie du Toit will pocket a whopping R1.4m, following a decision to upgrade the Paralympians’ monetary incentives to equal those of their Olympics counterparts, according to the New Age report. The Minister of Sports Fikile Mbalula said this at the official closing of Team SA’s London Olympic and Paralympic base, e-Khaya, on Saturday. Consequently, Du Toit’s three gold medals will fetch her R400 000 each, while the silver medal she won is worth R200 000. Team SA won eight gold medals, 12 silver and nine bronze to finish with an overall of 29 medals at the completion of the event.